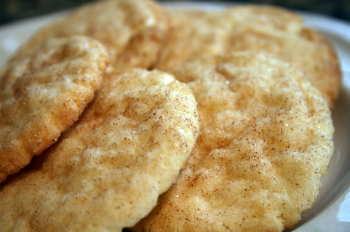 Snickerdoodle cookies are my Kids & Grandfathers favorite treat! Every Christmas my Aunt make him a batch and he hides them!!! - Preheat Oven to 400 degrees F (200 degrees C). Combine eggs, shortening and butter then add the 1 1/2 sugar, cream of tarter, baking soda, vanilla and salt and mix. Then mix in flour. - In a separate small bowl mix together 3 tablespoons of sugar and the 2 teaspoons of cinnamon. - Make into 1 inch balls and roll into cinnamon & sugar mixture. Place on ungreased cookie sheet then flatten the 1 inch balls with a bottom of a glass. - Bake for 8 - 10 minutes until edges start to turn golden or for chewy cookie bake until set about 8 minutes.